Promotional stainless steel travel mugs are ideal promotional giveaways in that they can become an almost permanent item in the office or in the home – quietly advertising your brand, logo or marketing message each time your client has a drink … So promotional stainless steel travel mugs make a good long lasting promotional item or business gift. Promotional stainless steel travel mugs can be given away at exhibitions and conferences or they can be mailed out as part of a promotional campaign. 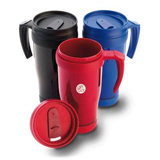 We have many styles of promotional travel mugs available. Within our range of promotional travel mugs we have stainless steel, plastic and eco friendly promotional mugs. Promotional stainless steel travel mugs all have a generous printing area to be able to get your message across. When printed and on the recipients desk promotional stainless steel travel mugs make an ideal promotional item for keeping your name and message in the minds of your customer every day. This ever popular promotional item has different printing methods available to it. For example – promotional stainless steel travel mugs can be engraved and printed multiple spot colours, another cool and effective travel mug is the smart mug that allows you to have a full colour printed piece of paper behind the clear plastic to give the full thermo mug a printed effect. This is very suitable for enhancing your brand image or for new product launches. 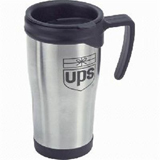 In addition to conventional promotional stainless steel travel mugs we have many styles of promotional mugs available. 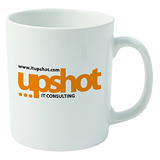 Within our range of promotional mugs we have earthenware, acrylic, china and glass promotional mugs. Heat revealing mugs which are sometimes known as “ Magic mugs”. This type of promotional mug reveals a hidden message only when hot liquid is added into the mug. This promotional item is a really novel way of bringing you brand or marketing strapline to life. Within our portfolio of promotional mugs, we offer extremely competitive rates on wide range earthenware promotional mugs including two of the most popular shapes the Durham mug and Sparta mug. These two promotional mugs are available in a wide selection of different colours and both of these promotional mugs make excellent promotional items or advertising gifts. Why choose a promotional mug as your promotional item or advertising gift. The answer must be versatility and longevity. The promotional mug is a promotional item that is at home in the directors board room as it is in the canteen – and in each environment your promotional mug will be advertising your logo or brand every day of the year. So whenever you are considering a promotional product campaign don’t forget to consider the promotional stainless steel mug as a really effective promotional item.